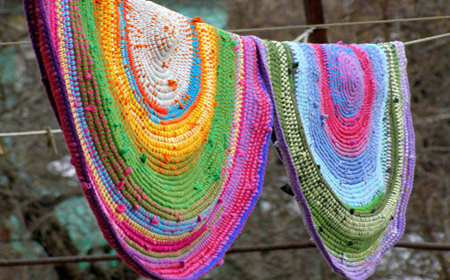 You can combine T-hirt yarn or recycled fabric with various kinds of recycled materials like wool, thread remnants and plastic bottles; because the main idea is to make ecological crafts to decorate our house and/or create functional objects to use in our daily life. This entry was posted in Recycling Ideas and tagged recycled materials, recycled thread, recycling ideas, t-shirt yarn on January 29, 2014 by Sue. 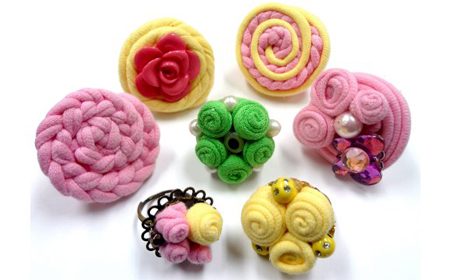 This entry was posted in Jewelry and Accesories and tagged how to make rings, ideas, jewelry and accessories, recycled fabric, t-shirt yarn, t-shirt yarn rongs on January 23, 2014 by Sue. 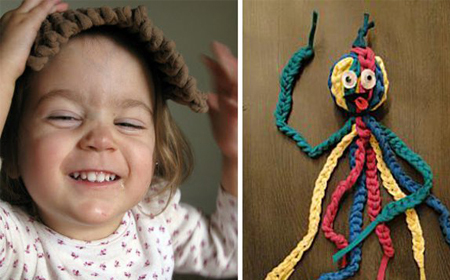 Using T-shirt yarn the kids can have a great time making various projects and crafts, and at the same time, the parents can share a creative time teaching them how to use recycled materials for creating. This entry was posted in Crafts and tagged crafts for kids, crafts with braids, ideas, t-shirt yarn, tutorials on January 6, 2014 by Sue. It`s really easy to make a fringed cushion, all you need is time and patience because if you want to make a big cushion you need to tie at least 2.500 fabric strips, but the result is totally worth it. 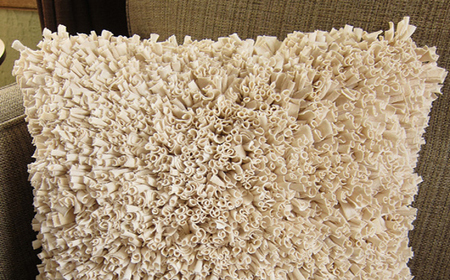 You can achieve a gorgeous cushion with a very nice texture. This entry was posted in Decorate with fabric and tagged decorate with fabric, fabric strips, fringed cushion, how to make, ideas, recycled fabric on January 6, 2014 by Sue. 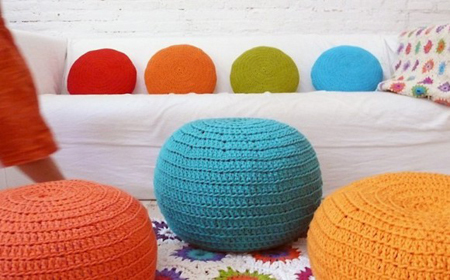 There are several ways to make a crochet heart: flat, with volume or empty (to fill it and make a cushion, for example). 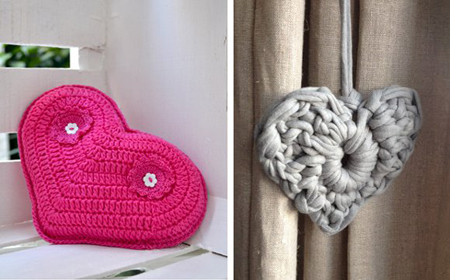 Today we are going to share a few ways to make crochet hearts, so you can choose the technique that fits your needs. This entry was posted in Crochet and tagged crochet, crochet hearts, decoration, ideas, models, t-shirt yarn, tutorials on January 5, 2014 by Sue. With T-shirt yarn you will be able to weave a tablecloth, because with this material you can achieve a functional object with a nice texture and a beautiful aspect that modernizes the table’s decoration. 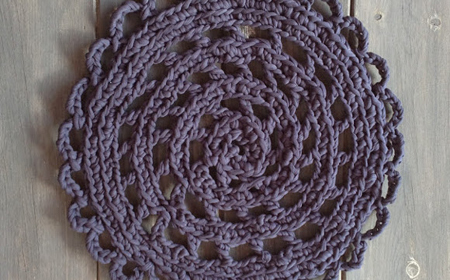 This entry was posted in Crochet and tagged crochet, crochet xl, fabric strips, ideas to decorate, pattern for a tablecloth, tablecloth on January 5, 2014 by Sue. 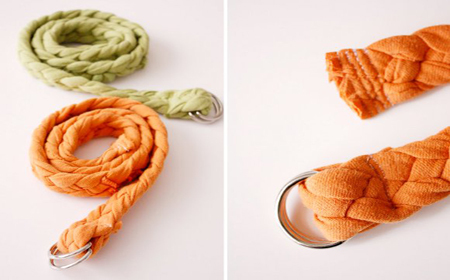 If you are a beginner using T-shirt yarn you must start practicing with easy projects, one of them is to create accessories with a braid of 4 strips, like these beautiful belts that deliacretaes shares with us. This entry was posted in Jewelry and Accesories and tagged accessories, belt, fabric strips braid, how to make, t-shirt yarn, techniques on January 4, 2014 by Sue. Lately in fashion shows we have seen in the runways this model of necklace and the artisans are more likely to make this design using recycled fabric. 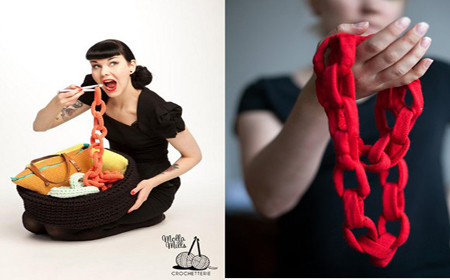 We are talking about chain necklaces made with fabric links, which you can make sewing the fabric or by crochet. 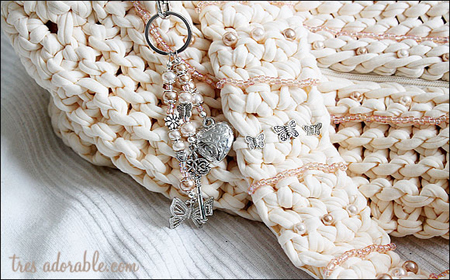 This entry was posted in Jewelry and Accesories and tagged accessories, fabric chain, how to make a necklace, jewelry, necklace, recycled fabric on January 3, 2014 by Sue. This entry was posted in Handbags and tagged decorate bags, decoration, handbags, ideas, imitation jewelry, recycled fabric, t-shirt yarn bags on January 2, 2014 by Sue.